Recorded as Hare, Hair, and the much rarer Hares, this Anglo-Scottish and sometimes Irish surname has a number of possible origins. The most likely is as a derivation from the Olde English pre 7th Century word, "hara", meaning a hare, and hence a medieval nickname either for a fast runner, or given the robust humour of the Chaucerian period, the complete opposite! The name can also be topographical from the Olde English word "haer", meaning stony ground, and as such described somebody who lived at such a place. It can also be a development from the Irish (Gaelic) name "O' hAichir", the modern O'Hare meaning the descendant of "Aichear", a personal name translating as sharp or fierce. Early examples of the recordings include William Hare, a burgess of the capital city of Edinburgh, Scotland in 1366, whilst Johannes Hare appears in the Poll Tax rolls of Yorkshire, England, in 1379. John Haire was tenant of the abbey of Kelso in 1567, whilst Sir Nicholas Hare who died in 1557 was a judge, and the member of parliament for Downton in Norfolk in 1539. Hugh Hare (1606 - 1667) was the first Baron Coleraine in the Irish peerage, and he supported King Charles 1st of England during the Civil War and rebellion of 1640 -1660. 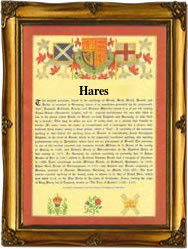 The first recorded spelling of the family name is shown to be that of Walter le Hare. This was dated 1166, in the Pipe Rolls of Surrey, during the reign of King Henry 11nd of England, 1154 - 1189. Surnames became necessary when governments introduced personal taxation. In England this was sometimes known as Poll Tax. Throughout the centuries, surnames in every country have continued to "develop," often leading to astonishing variants of the original spelling.